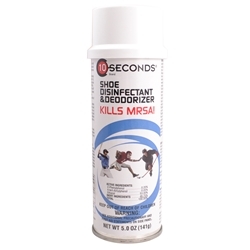 The only EPA approved shoe disinfectant on the market, this formula doesn't just kill bacteria -- it destroys it! This powerful hospital-use disinfectant and deodorant acts quickly on germ-laden surfaces after they have been thoroughly cleaned. Reduces the hazard of bacterial cross-contamination. Effectively sanitizes against odor-causing organisms on athletic mats, athletic shoes, and similar porous surfaces on other athletic equipment. We are now cleared to ship this product to California! !